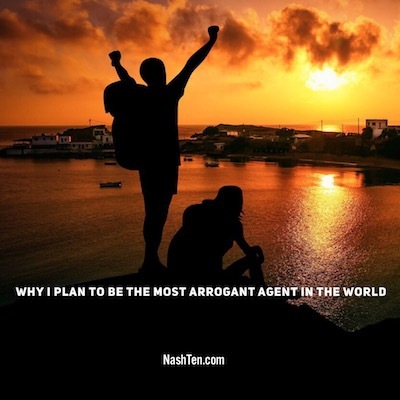 Not long ago, a fellow real estate agent called me arrogant along with a bunch of other words that I’ll choose not to share with you. One of my clients sold their personal home and right after closing, I stopped by the house to pick up my signs and lockbox. And when I say right after, I mean within 5 minutes of my client signing the documents. The sale was a split closing which means the buyer is closing at one title company and the seller at another. Therefore it’s not “officially” closed when one party finishes signing. The buyer’s title company has to deliver a check to the seller, and the seller has to deliver the deed to the buyer. That’s when most sales are considered closed and the buyer is allowed to take possession of the home in Tennessee. It typically happens within a few hours. Or at worst, the next business day. However, that’s not what took place with my client’s home. When I stopped by to pick up my sign and lockbox, I noticed cars in the driveway that should not be there. Immediately, I knew what happened and called our title company to see if they received the funds and buyer signed documents. “Nothing yet”, the attorney said. And I knew the buyers were scheduled to close about three hours before my client. So I called the buyers agent and asked them to vacate the home and return the key until the proper time. That’s when the name calling commenced and the other agent refused to discuss it further. I called this agent's broker who was nice, but not much help. Imagine how you would feel if someone moved into your home and you had not received the money that they owe you. Or even sent the paperwork. We had no proof that the buyer even signed the closing documents. There is a ton of liability for all parties when this happens. Legally, my client still owned the home. In addition to being a breach of contract, my client could have filed all kinds of charges. So I called the buyer’s title agency to see when they would wire my clients proceeds. They were going to wait until they received the original documents, which were scheduled to be delivered the next day by FedEx. My client's main concern was getting the proceeds, so I did what I had to do to get the original documents to the title company the same day. Not only to limit the liability but to make sure my client received the proceeds as quickly as possible. I spent a few hours of time protecting my client when others wouldn’t take a minute to solve the problem that affects everyone involved. That’s sad. The Daily Deal in Nashville is this renovated, brick ranch home located near downtown Franklin. This home is listed for less than $450,000.